February 8, 2016 - Like us now! In the age of social media, when there is more content produced than ever before, it is becoming increasingly impossible for users to keep on top of latest happenings surrounding them. Twitter’s timeline is very fast. Facebook’s ever changing algorithms often fail to realize what we are interested in. On the other hand, very often there are multiple news sources and versions of breaking stories at different websites. Which one to trust and which one to not is fairly confusing. Such is the condition of news media today. There is a news application brewing inside a software house in Lahore — TkXel, which aptly solves the above all problems. ‘News In 60’ is a mobile application that keeps users updated with breaking local and international stories. As the name suggests, the news is collected from multiple sources and is then hand-written by a team of editors, in a very short paragraph, to provide a concise and crisp nugget of the news to the readers. I found the application to be pretty straightforward. There is no user on boarding process — no login or sign up is required. You can start reading the news instantly after the download. Using the gesture of swipe, latest and previous news can be read. In terms of quality, it delivers what it promises. I have been using the application for almost two weeks and it never for once crashed! 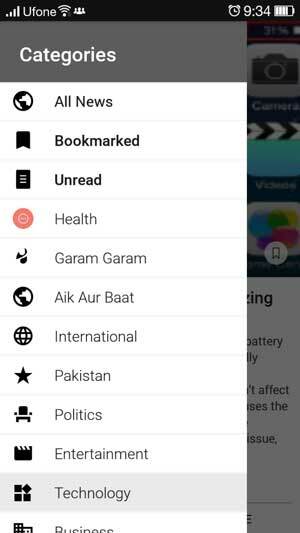 The hamburger menu contains option to read bookmarked stories or follow some specific tracks including Pakistan, International, Technology, Politics etc. Settings have options to turn on night-mode and turn off the notifications – which I did instantly, too many notifications for my liking. Although Irfan claimed to source the news from multiple platforms, while inspecting the application, I found only one source attached with every news nugget. Moreover, there was absolutely no mention of the news source with the story, which questions the credibility of provided information. Let’s hope it will be included in the next version release. Irfan and his team of editors are currently incubated at TkXel. Umair Javed, founder and CEO of TkXel, not only showed keen interest but also fulfilled the promise he did last year at Microsoft Startup Party to invest in some of the Pakistani startups. He, along with Raza Saeed of PakWheels, has invested in this application. Irfan declined to share any information in terms of numbers on investment. While talking about the business model and monetization plans, he said that current focus is to build a great user base and deliver accurate news to readers. Monetization is not their top priority right now. He further added that once they have enough users in Pakistan, they might launch location specific applications for different regions. ‘News In 60’ has a close resemblance with InShorts, an application based out of India and doing exactly the same work. It wouldn’t be wrong to say that News In 60 is highly inspired in terms of design and missions from its Indian-counterpart. That application already has more than 1 million users and some of the renowned venture capitalists and firms have invested more than 20 million dollars in that startup. All in all, News In 60 application was a delight to use. At the time, when our Google PlayStore is overcrowded with mediocre titles, this application is a breath of fresh air. Simple. Straightforward. Sleek in design. I will highly recommend this to anyone who wants to consume more news and updates in less time. Here are the Android and iOS versions for download.